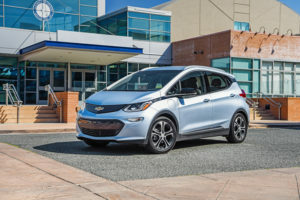 Chevrolet’s all-electric Bolt will be introduced later this year with Bolt pricing to start at $37,495 for the base LT model. General Motors is teasing out info in advance of the 238-mile BEV’s launch and in addition to the base price let it be known this week that there will be at least one other trim level-the Bolt Premium. No pricing info yet for that one, though. The Bolt LT will come with variable regenerative braking on demand, cloth seats and a 10.2-inch color info screen, among other things. Chevrolet says the Premium trim will include leather-trimmed seats, rear-view camera screen in the rear-view mirror and a surround-view camera that lets you see all around the car from the driver’s seat. There will be lots more, obviously, but we’ll have to wait for Chevrolet to start leaking details. Meantime, the first few tens of thousands of Bolts will be eligible for a federal tax credit of up to $7,500. So expect Chevy to factor that into its advertising. Don’t let ads for a “$29,995 Bolt” fool you, though. You’ll still have to qualify for and fiance a $37,495 car if you buy one. The tax credit comes when you file your annual income tax return at the end of the year in which you buy the car, and it only offsets taxes owed. If you only owe, say, $6,500 for the year, then that’s all the credit you’ll get. Consumers who lease don’t qualify for the credit, but it usually is applied by the leasing entity to reduce lease payments.